Many people starting a ketogenic diet have the same question. The short answer: exogenous ketones help you get into ketosis faster and support many of your health goals on keto. After you start eating a ketogenic diet and enter nutritional ketosis, your body runs on energy molecules called ketones. Ketones are what replace glucose as the main source of fuel for your body. Exogenous ketones are those same molecules your body produces, except they’re made as a supplement to help people reach a state of ketosis faster. Exogenous ketones are supplemental ketones made to mimic the ketones produced by your own body when you follow a Ketogenic Diet. They can be found as ketone salts or ketone esters. Ketones, or ketone bodies, are energy molecules produced by your liver when blood glucose is low as a result of fasting, carbohydrate restriction, or the ingestion of MCTs. Ketones made in your body are also referred to as endogenous ketones (endo- means internal), while ketones made outside of your body are exogenous (exo- means external). It is important to note that simply consuming this supplement is not the same thing as following a Keto Diet, but it can provide great support to your Keto diet, such as boosting your energy before a workout, improving brain performance, and increasing overall energy. The type of ketone used in supplements is BHB, or beta-hydroxybutyrate. On nutritional ketosis, BHB is the main energy source your body runs on. When you take exogenous ketones, your blood ketone levels increase accordingly. By taking them, you can enter nutritional ketosis within an hour, especially if you pair them with MCTs (medium-chain triglycerides) from MCT oil or MCT oil powder. Exogenous ketones bound to salts, also known as a ketone base, can be dissolved in any liquid, so you can take it as any other supplemental beverage. The health benefits you experience after taking exogenous ketones are due to their ability of putting you in ketosis. Not everyone can follow a very strict, high fat, low carb diet. Those who have done ketosis before know that when you get kicked out of ketosis, it can take awhile to get back in. You can use exogenous ketones to ramp your body back into ketosis quicker than it would with its own resources. Using exogenous ketone supplements after a period of eating carbohydrates will tell your body that you want to be using ketones for energy instead of those carbs.This makes it so you don’t have to go through the awful keto flu phase, which is where all the of the nasty side effects are. When your body transitions from using energy from carbohydrates to ketones, there can be a lot of unwanted side effects. These include low energy, bloating, irritability, headaches, and fatigue. This is because your body is “in between” burning carbs and burning ketones and hasn’t become efficient at burning ketones and producing them from your fat stores yet. The good news is that you can use exogenous ketones to bridge the gap. While your body is getting used to making its own ketones, you can supply it with exogenous ketones to eliminate all of these side effects. One common misconception is that taking ketone supplements will induce immediate weight loss, but ketones are only a piece of the puzzle in your weight loss journey. Remember exogenous ketones are supplements, and therefore should be supplementary to a low carb ketogenic style. Ketones don’t cause weight loss, they help cause ketosis. Ketosis is a metabolic state where your body is using fatty acids for its primary source of energy. Just because you are using fat does not necessarily mean you are going to be losing weight or have a decrease in body fat percentage over an extended period of time. You can be in deep nutritional ketosis (>3.0mmol/dL) and experience an increase in body fat percentage. You can also be in deep nutritional ketosis and have a decrease in body fat percentage. It all depends on how much fat and protein you are eating, in addition to being below a carb threshold that will induce ketosis. Exogenous ketones are a tool to get you into ketosis or to boost your energy levels while already in ketosis. 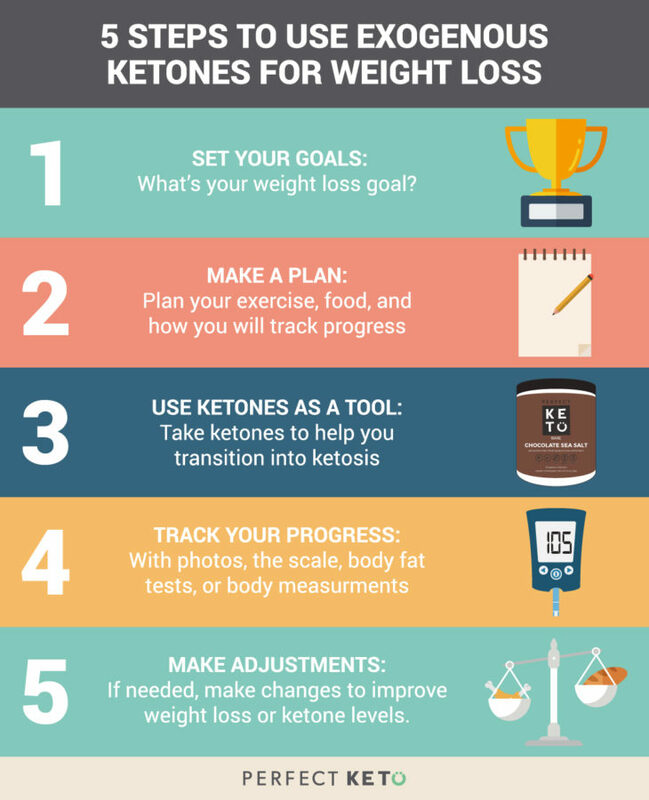 If your goal is weight loss – exogenous ketones can get you to your starting point (a state of ketosis) so that you can then take the ketogenic diet to where you want to go (your weight loss goals). Many people start diets with goals such as losing 20 pounds in 2 weeks and think that the faster they shed weight, the healthier they are. This approach is unsustainable and potentially unhealthy. The more effective approach is to lose that weight over a longer period of time, and get comfortable with the new habits you will form on a ketogenic diet. How do you set a reasonable weight loss goal (for example, 0.5lbs of fat per week)? The best way is using a macronutrient calculator, then getting familiar with eating approximately that much food. The key is to adjust your protein, fat and calories to find a ratio that works for you. If you are gaining body fat on a ketogenic diet, eat less dietary fat. If you are not in ketosis, eat fewer carbs. If you are losing weight but feeling fatigued, eat more protein and fat. Supplementing with exogenous ketones will help with lethargy. Bottomline is, when you understand how exogenous ketones work and have realistic expectations about them, they can help you lose weight and be healthier. You start by restricting carbs and adopting a ketogenic diet. After starting to eat keto, you take an exogenous ketones supplement. If your diet allows it, exogenous ketones help you enter nutritional ketosis. In ketosis, you can start losing weight if your fat and protein macros are properly dialed in, because your body is burning through the fat stores in your body to make internal ketones. This fat burning is what causes healthy weight loss. When you start eating a low carb, ketogenic diet, your stored glucose (glycogen) gets depleted, so your cells start burning stored fat for energy. This means your body is put into fat-burning mode, not fat-storage mode. This fat burning effect is what makes the keto diet so effective for weight loss. To lose weight, you want your cells to burn stored fat, not dietary fat, so if one of your goals on keto is weight loss, eating less fat can be beneficial to let your cells use up your fat stores. Ketosis can help sustain weight loss by helping regulate hormones that affect weight, one of them being cholecystokinin (CCK). After you eat, the hormone cholecystokinin (CCK) is released by your intestines. CCK is responsible for stimulating fat and protein digestion and inhibits the emptying of the stomach. This makes CCK a great regulator of food intake. On the flip side, losing weight can cause your body to secrete less CCK, leading to less satiety after a meal. But this is where ketosis can be helpful. The same study showed that just one week of being in ketosis was able to raise levels of CCK back to where it was before weight loss. That means eating a ketogenic diet can help you avoid cravings for food all the time after losing weight, reducing the chance of gaining the weight back. A ketogenic diet can help reducing appetite by altering the concentrations of hormones that affect hunger. This means you can better listen to your body’s true hunger signals without worrying about counting calories. Fat and protein are also more satiating than carbs. When you’re eating a ketogenic diet full of healthy fats, protein, and low carb vegetables, you experience more stabilized blood sugar. Keeping blood sugar low is essential for health. Exogenous ketones can support your ketogenic diet and your health goals, but they’re not a quick fix. You should use them in addition to a properly formulated, healthy ketogenic diet, not as a standalone supplement. Don’t take the easy way out of assuming that eating ketones will induce weight loss. Do use ketones to help you on your ketogenic diet. Do make a plan of what and how much you want to eat for your goals. How long does your body stay in ketosis after using exogenous ketones? I have read that you get into ketosis within an hour after consuming, but cannot find how long you stay in ketosis? Would it be beneficial for my 11 year old picky eater with Aspergers and behavior issues to take your product? Is it safe? My husband and I eat keto but he refuses, so I’m looking for alternative options for his brain health and blood sugars. I still need to know exactly WHEN to take my scoop? In the am? Before a meal? How to incorporate them into fasting? Depends when you want the benefits, in the AM and after or between meals would be a good time. It really depends on the person. We advocate switching to nutritional ketosis to get the best benefits. Can you take ketones and follow a clean eating diet which includes carbs like sweet potatoes, rice, quinoa, etc., and still lose weight? good information, saved to fav (:. If you are eating carbohydrates what does your body do with the glucose when you take ketones? It can burn both so does it store as fat because your in ketosis and using ketones for energy instead of the glucose? I practice a Cyclical Ketogenic diet where I incorporate a higher carb day once a week. The day following a higher carb day, I follow an intermittent fasting day where I do not eat anything (no fats either) for 20-24 hours. I do this as a cellular cleanse (autophagy) as well as a way for my body to get back into ketosis. Would it be helpful to add an exogenous ketone on this particular “fasting” day to get into ketosis quicker? Would I notice better results or is my own nutritional ketosis enough? I am relatively fit with a pretty low fat percentage for my gender and age, but I am always striving for an even leaner “more chiseled” look. Just questioning when the best time to take this would be. I do intermittent fasting and find that a scoop of the Chocolate sea salt with my coffee makes a great mug of keto “Hot Chocolate”. This helps me stay alert and feeling full until I decide to eat…. at least 20 hours fasting. I also feel like my brain is on fire. I’m a believer. Am I doing this right? I am using this to lose weight and even though I have only had this a couple days I feel like it will help. I am following a low carb diet and have purchased urine ketone dip sticks. It has the colour chart on the side of the container but I’m not sure what I should be looking for to ensure I am keeping the carbs low enough. Can you help? What should I look for when purchasing ketones? How do I know I am getting what I want instead of some fake? Surely there are ketone imposters just like everything else. And can I get them at the local health food store such as GNC? Does taking inosito for PCOS interfer with ketones? Is it OK to the both inositol and perfect keto? soooooo .. am I burning fat (aka like I would be in nutritional ketosis) or am I just adding a bunch of ketones to my body to make it seem like i’m in ketosis? I don’t get how putting exogenous ketones has anything to do with the level of glucose in my body and then switching my primary fuel source to fat? I’ve purchased the salted chocolate perfect keto supplement and I can say it’s quite delicious. I drink it 2 times a day and have for 3 days now . I eat a ketogenic diet counting macros with MFP . But my body is resisting nutritional ketosis . I register ketones in my urine a few hours after consumption but then they disappear until the next drink…I have been eating a ketogenic diet for several weeks but not in ketosis .I’m looking for any help you can provide for me…. Since starting exogenous ketones I have stopped post menopausal facial hair growth..why? Yes the main use is to get you into ketosis. It will get you into a short-term (2-3 hour) ketosis to help bridge the gap as you transition to nutritional ketosis. If you are already in ketosis and not cheating, what benefits would perfect keto or a supplement/ Ketone drink provide? I see a lot of hype around these products but don’t know how you would use them when on plan. Would they help speed fat loss further? The insulin spike will cause carbs to be cleared from the blood and stored as fat. Ketones are shown to be used preferentially to glucose when they are both present. The purpose of taking ketones after a carb heavy meal would be to bridge your way back to nutritional ketosis (which will take time and carb restriction). Have you tested your blood ketones? Urine tests just show the overflow acetone by-product (what’s not being used). Exogenous ketones put you at a temporary artificially raised ketone levels to help you bridge the gap to nutritional ketosis or for an extra boost when you are in ketosis. I don’t know! Anyone else have any experience here? After 12 days of supplementing with ketones drink and a low carb diet, I haven’t seen any fat loss. Is this normal? Can it be that my body just doesn’t respond to this? Go lower on the carbs, try less than 20g per day (total, not net). If that does not work also try reduce protein, but I like to keep it at minimum 80g per day (to prevent muscle loss). How many times a day should you drink it? How many times a day should I drink? If I have large ketones in my body and have stalled …what should I do? Meaning what is the answer eat more protein more carbs less fat or less protein more carbs I just know that I need my body to be having low ketones to put me back to where I will be burning fat ! Hi Samantha! There’s no danger to taking Perfect Keto multiple times per day and multiple scoops. Most people use Perfect Keto between 0-3 times per day and find it best to start slowly and go from there to see what is most beneficial for you. Hello Amy. Drinking Perfect Keto varies by person. There’s no danger to taking it multiple times per day and multiple scoops. Most people use Perfect Keto between 0-3 times per day and find it best to start slowly and go from there to see what is most beneficial for you. You can take it in the morning or between meals to put your body into an effortless fat-burning mode. You can also try it before/during exercise as an energy drink. It’s also best to take on an empty stomach for peak mental performance and sharper focus. (PK Pro Tip: Mix it in your morning coffee or tea). After eating a meal will also do, to help you boost yourself back into ketosis. What GI complications? I drive a bus all day with limited stops. I really want to try it, but If PK causes upset stomach / diarrhea, that could be a serious deterrent. I’ve been doing low carb for about 2.5 months and down 30lbs. I’d like to go full keto but am concerned about digestive issues. So if one were to ingest exogenous ketones and raise blood ketone levels (say after a heavy carb meal) to say over 0.5mmol artificially – are you in nutritional ketosis? and if not, how do you know if you are in nutritional ketosis. I’m usually in Ketosis for 4-6 hours after drinking my serving of exogenous Ketones. Thank you for the information provided in the site. I have ordered perfect keto and I look forward to incorporate it in my keto diet. Would exogenous supplementation with ketones during say intermittent fasting, result in a decreased endogenous ketone production (is there a negative feedback mechanism in place)? What is the calorie/energy intake per ketone supplement serving? This will need to be added to the daily calorie intake and would be especially relevant to those on a calorie restricted diet. How do I know how much fat and carbs I should consume? https://perfectketo.com/calculator/ is a good place to start. How long to you take it for…. a week…a month….a few months? Does anyone know if taking the aromatase inhibitor Exemestane causes slower weight loss or a low ketone reading on a meter? I have been eating low carb for 2 months. Have lost 11 pounds and building muscle. My urine will show no ketones after several hours after the drink even if I have had no food??? I have the same question and don’t fully understand your answer. If you have both glucose and ketones in your blood, and the ketones are what gets used for energy, what happens to the glucose? Does it remain in your blood? Thanks. I don’t have a great answer Laura, my apologies! Anyone with useful experience who can chime in? I have been on ketogenic diet for a month now. I have a blood meter and I seem to stay in the light ketosis range (typically 0.5-0.7). Will exogenous ketones boost me into the suggested ‘Optimal Ketosis’ range? If you are already on a low cab diet to maintain ketosis…how should this be used in conjunction with that diet. I have heard that people experience hair lose when following a Keto diet, if already following a Keto diet and have stop the hair lose time frame will taking the supplement cause hair lose again? Can a person with type 2 diabetes benefit from drinking ketones? Can it help lower blood sugars? While doing this you can’t have any carbs? It’s possible but it depends on the quality and quantity of your food. How do you know when your body is in Ketones? I am eating Keto and have lost 30 pounds (50 to go), but don’t count carbs religiously and cheat occasionally, usually at social events. Would it be a good idea to use Perfect Keto every morning to help maintain ketosis to make make up for my lack of discipline? I have a headache, but I don’t know if it’s due to keto flu or a food intolerance (as I regularly get bad headaches from reactions to food). I got some Perfect Keto exogenous ketones to help with the transition, but I’m nervous that they could make my headache worse. Any ideas? I am in ketosis already because I’m stringently following the ketogenic diet. Would it be dangerous to drink ketones if I’m already in a heightened state of ketosis? My daughter is on glucophage, would ketone supplements be safe for her. Hi there, you can certainly do that but make sure you are still testing your ketone levels often to see if you are actually in ketosis. Hi there! We highly recommend consulting with your doctor first to see if taking our products or any other supplements would be okay for her . Hello Melissa! We highly recommend consulting with your doctor first to see if taking our products or any other supplements would be okay for you . Hi Kendra! Track your ketone levels to know how far you are into ketosis. You can read our blog – How to Easily Track Your Glucose Ketone Index (GKI) on Your Ketogenic Diet. This can help you find out how ketosis works best for you. I have been eating Keto for two months now. I feel great and I can see a difference in my body compostition but I am not losing weight. I only want to lose 5-7 pounds. I am 54 and in great shape bu the middle age middle fat is my challenge! Is my change mostly water loss? Sometimes I worry I am eating too much fat. Can you eat a lower fat diet, low carb and supplement with Ketones and still lose weight? I dont want to stay Keto forever….but would like to transition back to a healthy balanced, low carb ( not no Carb) lifestyle. I am very active and exercise almost daily. Any idea on how to take the Vanilla exogenous ketones? I was super stoked to see that my goodies arrived today at work so tried the Vanilla in my morning coffee with unsweetened almond milk and heavy whipped cream as usual. But I could not get over the taste and the smell. Any other suggestions on how to take it as I don’t know if I can take it in my coffee again, had to force myself to drink it. It has a very specific smell and overwhelming taste. But I don’t want to let it go to waste. Help? The unflavored Collagen in my other coffee was amazing btw. Creamy, jum! Is there such thing as taking too much Ketone Supplements? I was wondering why after about an hour of drinking exogenous Ketones they wouldn’t show up in a blood test? Could you shed some light? Can you please tell me the difference in products, and which one is best for beginner to lose weight. Hi Patty! Exogenous ketones help raise your ketone levels to help you get into ketosis. You can then use ketosis as an approach to losing weight. Keto Collagen is great for recovery and soft tissues. MCT powder is a great source of fat for fast energy or a snack 🙂 Good luck! Hi Alexander – I’m still a bit confused about the artificially raised ketone level from the exogenous ketones. If your body has “temporary artificially raised ketone levels then how does the body use these ketones if you’re not in nutritional ketosis? does it tell your body to get into ketosis faster? is the body now using fat for energy vs. glucose? I don’t understand if it’s an actual benefit or a perceived benefit to getting into ketosis if it still takes me 2-4 days to get into nutritional ketosis. Am I actually using fat or just drinking ketones? does that make sense? Hi Joann, I’m not aware of anyone who has reported that it causes hair loss. Hi, Mike. Yes, they should help boost your ketones! Even with a ketogenic diet, taking the exogenous ketones only raises ketone level to 0.4. I don’t have a high level of ketones even after a 5 day fast. What would cause this? The main reason to be using Perfect Keto, it’s to take it as complement for my diet, Atkins Modified to avoid epilepsy, it’s a complement and also could give me some open spaces with the food too; but I don’t have enough info yet, and will appreciate your recommendations. My only restriction are carbohydrates, 10% of the total. Hi Ivan, what kind of recommendations are you looking for specifically? Food, supplements, other? Hey Justine, you can take it as long as you’d like! If I’m in ketosis at .9 will this ramp up my ketones and kick me into fat burn? I’m watcging macros and eating keto. Hey Jess, yes exogenous ketones will elevate your ketones and are a great supplement to eating keto! Hi Rhonda, this is actually very common after being keto for a few months and becoming keto-adapted. It just means you are better utilizing the ketones for energy instead of dumping them in your urine. Hey Ali, everyone has a different carb threshold and tolerance so you’d just have to test it out and see! I’m usually back out of ketosis within 24 hrs. I can’t stay in ketosis. Need to figure out if I’m still eating too many carbs, not enough fat or too much protein. Hey Susan – the darker the purple color on the urine sticks means the more ketones you are producing. As long as you’re starting to turn that stick purple, you are on the right track! Jackie, yes it sounds like you’re doing it right! If you’re feeling great and your brain is “on fire” as you mentioned, those are great signs! Nutritional ketosis has been shown to be safe and effective for children with epilepsy. And with all of the supplements available there is an increased interest in using exogenous ketones for seizures. Maybe try searching for clinical trials that are using them for children with epilepsy. Or contact one of the teaching hospitals that specialize in this and see if they have any experience using it with their patients? Good luck. Would this be useful for someone without much fat to loose who is cutting to look as lean as possible for a swimsuit photoshoot a month out? Try the App Keto Simple Stupid, it’s a Red circle with a yellow pig, with a red scale inside of the pig! I love it! I have hypothyroidism from chemical exposure, I am on natural thyroid and T3. It has been a real struggle, My doctor told me most people in my condition would be severely obese at this stage, but i’m not. I’ve been using perfect keto trying to stay in ketosis, I currently weigh 164 lbs. down from 174. I should weigh 120 but would be content with 135. any suggestions would be great ! Try 70% fats 15%protein 15%carbs. I consume 3Tbs. olive oil, avocado, or coconut oil per meal. Also use ghee to fry eggs in. Females use 2Tbs of the above oil. If your over 50 yrs. Dr. Don Colbert recommends a Lipase supplement to help break down fats. He has a book titled The Keto Zone I highly recommend it if you are doing a Keto Diet. I started out weighting 256lbs. lost 22lbs and 17inches in 4weeks. I eat 6oz. protein, 20grams carbs and 70%fats from above fats. Hi. do you possibly know if you can take the ketone supp and still drink coffee?? Does this product actually put your body into ketosis or just put ketones into your body? I’m trying to understand how I can benefit from exogenous ketones. It just seems to my “uneducated” mind that the only benefit would have to come from a natural state of ketosis. Please help me understand. I’ve been instructed to take my ketone supp 15 minutes after a meal, also time it out to be 30 min before you workout (if you’re planning to use it as an energy boost) It’s also recommended to not consume carbs, starches, or sugars 4 hours after taking the ketone supplement. I really respect how they are looking out for the consumer over trying to push their product. They are honest and informative in the explanation of how this works, two thumbs up for that! That being said I do really like this product a lot. Its been a huge help in maintaining this lifestyle. Lipase is a digestive enzyme made by the pancreas that helps to break down certain fats. Most people do not need to take lipase supplements because our bodies naturally make ample lipase, but some people with cystic fibrosis or celiac disease may benefit from taking lipase. I’ve been trying a keto diet for a couple of months now and only show 5-15 mg/dl on the urine stick. I received my Perfect Keto today, took 1/3 scoop and registered 80!! I’m finally in the purple! Thanks!!! Is caffeine something that disrupts ketosis? You have to be careful with what mineral the ketones are stabilized in. The ketones won’t hurt you. The potassium, calcium, magnesium, and sodium, might! If you are a heart patient, I wouldn’t do it without monitoring your electrolytes very very closely with a cardiologist! I’m at that same point as Mia, haven’t loss much weight. Would like to know same question? Exogenous ketones break yourfast,but its also up to you. Ico sider andythingwithcalories breaking a fast…but some people do fat fasts, egg fasts, and many different types. what exactly are you asking? Do you mean 50g of carbs? There are tons of keto recipes and such online. Think large portions of leafy greens and veggies, small portions (1 chicken breast or 5oz steak) mixed in with various plant-based fats like coconut oil, olive oil, avocado or dairy fats like heavy whip or dense cheeses and cream cheese. how do you test yourself to see if you in ketosis? I experienced hair loss/thinning. I found adding some targeted carbs (half of a small, boiled sweet potato) two nights a week slowly fixed it. I’m female and 44 years old for context if concerned about specific hormonal needs. I have a BS in Biochem, and have been a Medical Lab Tech for several years. 1. Are you suggesting there is a up-regulating function or positive feedback from ketones and ketone production? 2.Can you cite any peer-reviewed literature I can read up on? I ordered the pills and need to know how to use them – I am understanding this is a low cart high fat diet but I need to know what to and not to eat and when? and what? Can I just use your meal replacement shake to stay in ketosis and lose weight or do I need to make keto meals daily or a few times a week? Hi Anthony, none of our products are a meal replacement. Will taking your collagen supplements after working out break you out of intermediate fast mode? Hi Michelle, typically, anything under 50 calories won’t break a fast.